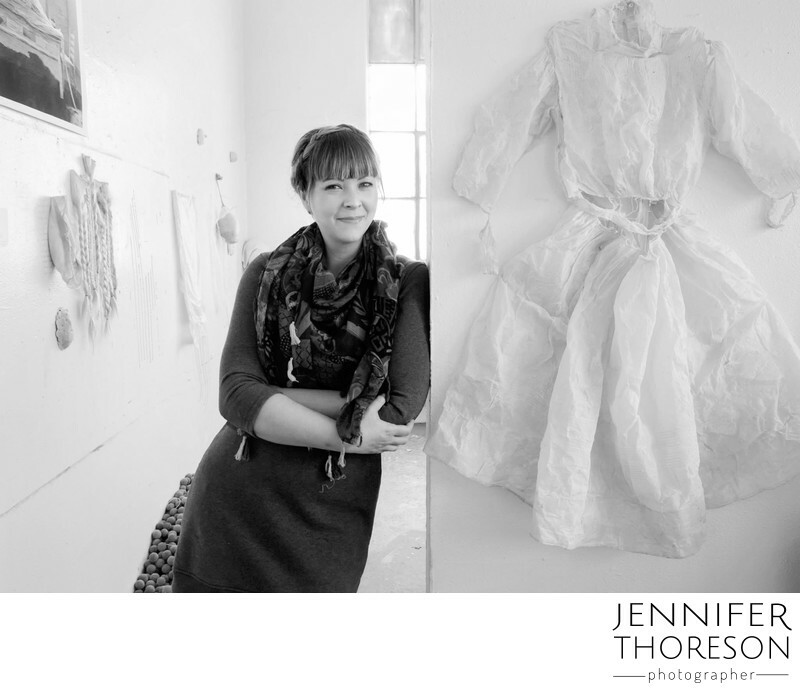 Jennifer B. Thoreson is a photographer and installation artist living and working in Albuquerque, NM. She creates pieces seemingly suspended in time – rife with emotion and the human condition, but paused. Her photographs appear to capture single moments of stillness within scenes otherwise fraught with tension, emotion, and vulnerability. Through her work, Thoreson provides the audience with a glance into relatable, ordinary lives that have been imbued with unrecognizable, often otherworldly, abstractions. In the captured pause, she allows the viewer to place themselves within the scene, and to wonder if these abstractions might similarly represent their own pain, worry, brokenness, grief, longing, and hope. She creates illustrations of the emotional, spiritual, interpersonal, and physical struggles and joys we experience over the course of our lives, showing us how these internal emotional outpourings, invisible to the human eye, might look if they were to physically manifest in the world. Her photographs are primarily composed of a palette of muted, neutral tones in which she includes careful selections of dark, saturated hues. She photographs her scenes using gentle washes of natural light. Her use of lighting points to the persistent hope brought by a new day, even in the darkest situations. She frames her images into balanced, symmetrical, one-point perspective views, forcing the audience to confront the scene directly. In spaces that seem starkly familiar, she introduces the unknown through the relationships of the bodies to one another, the use of sculptural elements to exaggerate limbs and figures, and the creation of sculpted objects that seem to form living elements within the tableaus. The scenes she composes bear similarities to theatrical sets and give the audience a glimpse into ongoing stories. Each piece of the composition is carefully selected and arranged, and is necessary to understand the narrative. Each fabricated object validates and enriches an aspect of the stories or characters shown. Finally, each finished photograph invites the audience to examine the complexities of the figures portrayed through the lens of their own relationships, experiences, and perceptions. She explains that “the sculptures, found objects, and installations are the heart of [her] process, and allow [her] work a voice and identity.” These carefully created sculptures and selected objects mark Thoreson’s work, and set a stage for the audience to question and examine the hidden realities of their own lives and relationships.